As even a brief survey of the world could tell you, we live in the future. As such, isn't it about time to stop plugging wires into all your devices? Qi-compatible charging is showing up in more phones and tablets to make it easier to get some juice by just setting your phone down. Still, there isn't a good wireless solution for the car, but the Air Dock might be the first. This device is currently on Indiegogo with a few weeks to go, and we've got some prototypes to test. So, is this a crowd funding project you need to back? The Air Dock relies on a microsuction surface to hold your device in place. So you just attach the suction cup to your dash or windshield, then drop the phone on and it should hold. This is the same tech that was used in the Nexus wireless charging orb, which didn't hold particularly well. However, in the case of the Air Dock, the hold seems to be much better. The surface is completely flat, so the surface area of your phone in contact with the dock is much larger. You can give this thing a solid shake the phone won't budge. 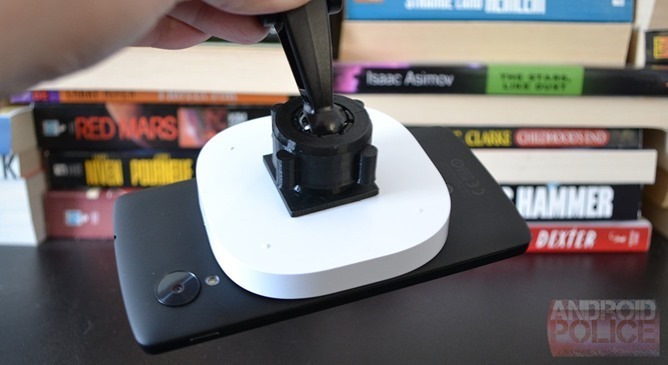 The standard Air Dock works best when the device has a smooth glossy back (like a Galaxy S4 or Nexus 4) – that's just a consequence of how microsuction works. That's why there is a second version of the Air Dock that relies on magnets – we have one of these in for testing too. 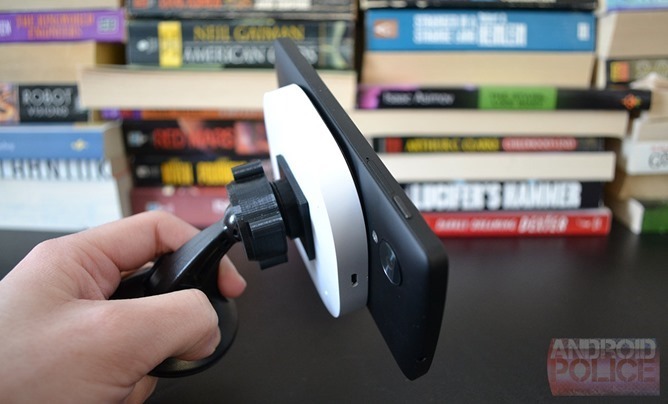 The magnets in the dock line up with the metal disks in some phones like the Nexus 5. The matte back on the N5 does stick to microsuction, but not well enough to use as a car dock. So that's the principle behind attaching the phone, but the real reason you might want the Air Dock is for the Qi charging. 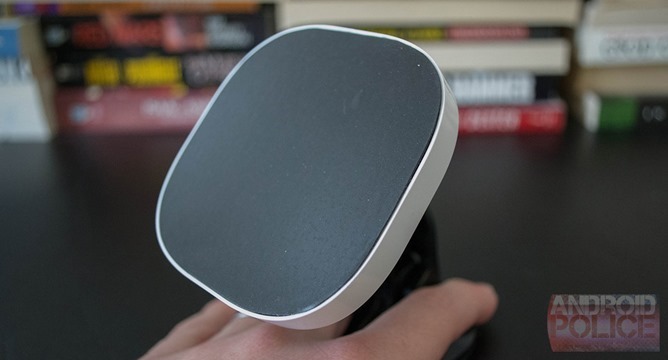 Behind the sticky surface is the inductive Qi charging coil. When your phone is attached, charging will happen immediately without plugging anything in. It requires a 2.1A micro-USB power adapter, though, like most wireless chargers. The regular microsuction Air Dock works very well with a smooth device. I attached a Nexus 4 to the Air Dock, and as expected, it stuck. You have to press a little when you attach to make sure the grip is strong, but then it's not going anywhere. I shook it around, rode around with it in the car for a bit, and it didn't come loose. When you want to detach, just give it a solid tug while holding the base and it should snap off. I also put the Nexus 5 in a case to simulate a phone that doesn't have a glass back, but is still somewhat glossy. Again, the standard Air Dock held on very well. The grip wasn't quite as solid as it was with the glass N4, but I'd say it was 90% as good. Still more than sufficient to use as a car dock. Microsuction surfaces will accumulate dust over time and get less grippy, but you should be able to wash it off and continue to use it normally. I haven't had the dock long enough to see how that works here, but that's been the case with similar devices I've used. What really appeals to me is the magnetic version. Inside are a few tiny neodymium rare Earth magnets spaced to grab onto the Nexus 5 just like the official Nexus charger. The Nexus 5 clips on just as you'd expect and stays put. It doesn't quite have the supernatural hold of a glossy phone on the microsuction, but it's still more than enough for a car dock. Some other phones (like the GS4) have sensors that will be triggered by the magnets, so you'd want to use the regular Air Dock instead. 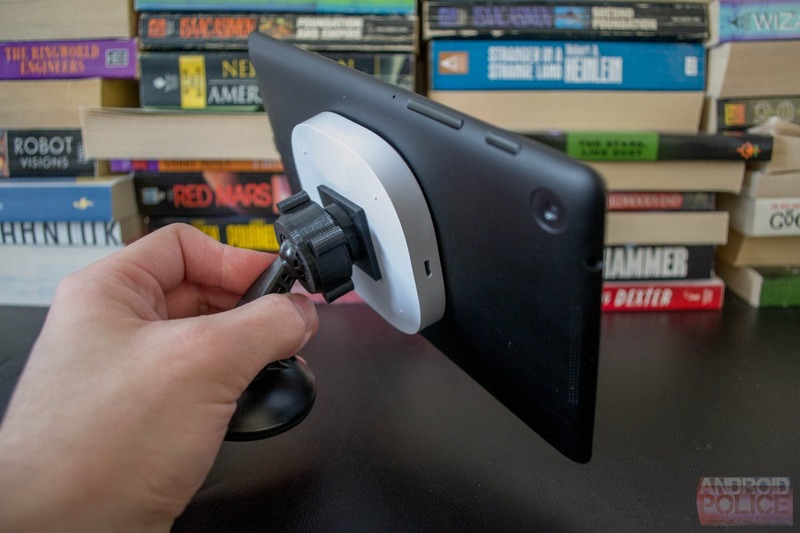 You might be wondering if the magnets will also work with the 2013 Nexus 7, since it uses the same Nexus charger system. Well, yes. 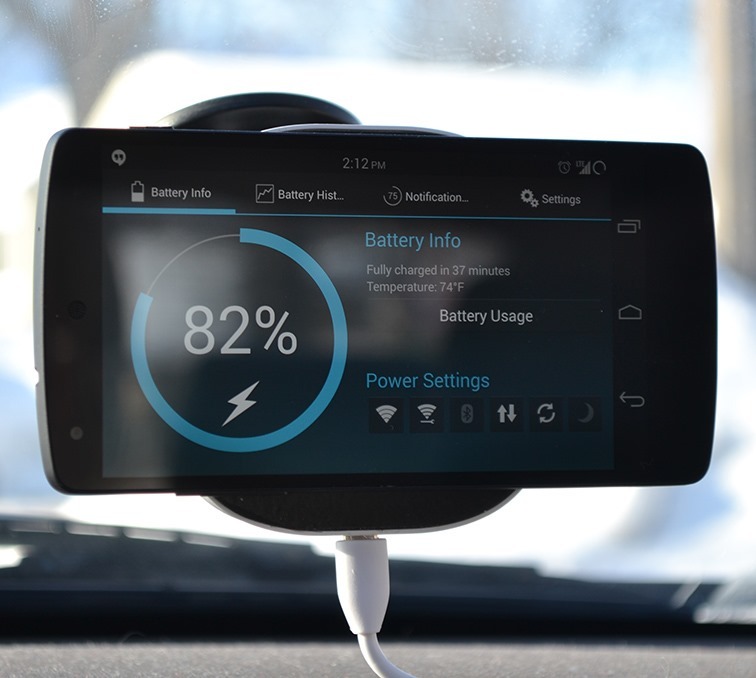 I have to say I'm pretty jazzed about this – the N7 is pretty neat as an in-car navigation system. Obviously, you'll need to tether it to a phone or have the LTE N7 to make this practical, but it's still a nice option. The N7 stays attached, though I've noticed it is liable to fall off if hung completely upside down. In the car, it hasn't been an issue. As for charging, the Air Dock seems to provide almost 1A of current output to the device when plugged into a 2.1A adapter. 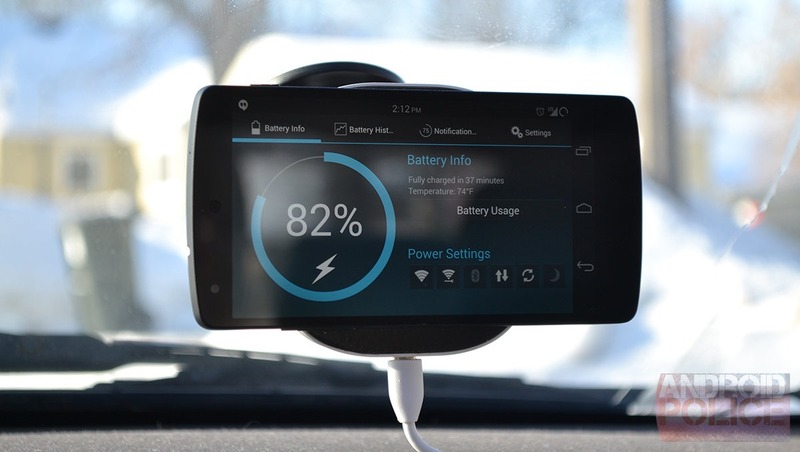 That's about what you'd expect from other wireless chargers and is sufficient to keep your phone charging while using turn-by-turn navigation (albeit a little slowly). I can't really speak to the rest of the build as this is a prototype and the mounting bracket is 3D printed. What I see of the final product looks good, though. It's looking like the Air Dock is going to hit its funding target, which is a fixed funding goal, thankfully. It is closing in on $50,000 with the minimum funding set at $60,000. There are a limited number of spots in the first fun of the campaign, so make sure to get your pledge in if you want an Air Dock by April 2014. More perks will be added if there is interest.